The woman prepared carefully before going out. Under her blue dress were a muslin underskirt with five rows of fine embroidery, another plain underskirt, red petticoats and a muslin chemise. She adjusted her hoop, placed a band of white lace, and reached for her old style bonnet. Her waist length hair was done up carefully. She tied her bonnet tightly about her before stepping out of her house. It was the fall of 1883. Her house was located in a notorious area near St. Marys. Her destination was unknown, and she may have gone to meet a man. Whatever her destination she did not arrive there, or not that anyone seemed to notice. Saturday, October 6, 1883. With winter coming on it was time to stack up with firewood for the cold months ahead. Wood-chopper and farmer James Porter lived on the Calvin Fuller farm about three miles east of St. Marys, along the Wabash bottom lands. With him were his son Joseph, and friend Henry Ishmel and they headed into the woods, a dog prancing at their heels. They were looking to cut new axe handles and maybe do a little hunting. They cut a branch or two that looked likely to make a sturdy handle. There was still a little light left for a more pleasurable task. They set the dog upon the hunt. The hound’s barking told them it had flushed out a rabbit or two. They hurried after the scampering dog, spied his prey, but their aim was faulty. The rabbit scampered away deeper into the brush. Not to be denied the dog pushed on after it. Soon the woodsman-turned-hunters heard another yelp and saw the dog returning with another treasure. In its mouth was a human skull. Horrified, Porter snatched the skull from the teeth of the dog. He looked around at his companions. What was going on? Though unnerved they decided they had just could not flee the scene. They pushed tentatively on into the ravine from which the dog had emerged not knowing what they might find. Their eyes were drawn to a piece of blue cloth. It was ablue dress, and not far from it other items of woman’s clothing. Not far away were a few human bones lay scattered in the leaves. Frightened by what he had found, James Porter rushed back onto the Clinton Road looking for help. He spied a man walking along and breathlessly shared the news of the horrible discovery. The man refused to help and stepped lively along his way. Porter started to head to his house when neighbor Thomas Beauchamp, on his way home from work, stopped. Porter told him what he found and Beauchamp, of more intrepid spirit, agreed to go back to the scene. About 75 yards east of the Clinton Road they descended further into the dark ravine. Searching in the growing dusk they found a human backbone and ribs. Nearby they saw more clothing. Drought noted that no one had disturbed the scene since Porter’s discovery. Nestled in some logs was the woman’s clothing. There were no bones in them. It was speculated she had been stripped naked during or after the crime. The lateness of the hour and darkness of the night forced the coroner to call a halt to the search until morning. He placed the bones in a box he had brought with him. He returned to Terre Haute, dropping off the box at the Katzeubach undertaking parlor. With Sunday morning’s light Drought returned to Sugar Creek Township. The night before he had asked Beauchamp to gather a search party for Sunday morning. Curiosity or concern had energized over 35 searchers in response. When drought arrived he found them fanned out across the hollows. They brought him a handkerchief full of small bones and a set of false teeth. He spurred them on to look for more evidence. They found a scrap of a local newspaper and a business card. Would these lead to the identity of the killer? The coroner ordered that shovels be brought forth to dig for more clues. Beneath thre crisscrossed logs they found a morass of decayed flesh and more teeth. The body had been buried in a grave so shallow that it allowed rooting hogs and dogs to tear away at the flesh. Dr. Moorhead, the county physician, arrived with the skull. 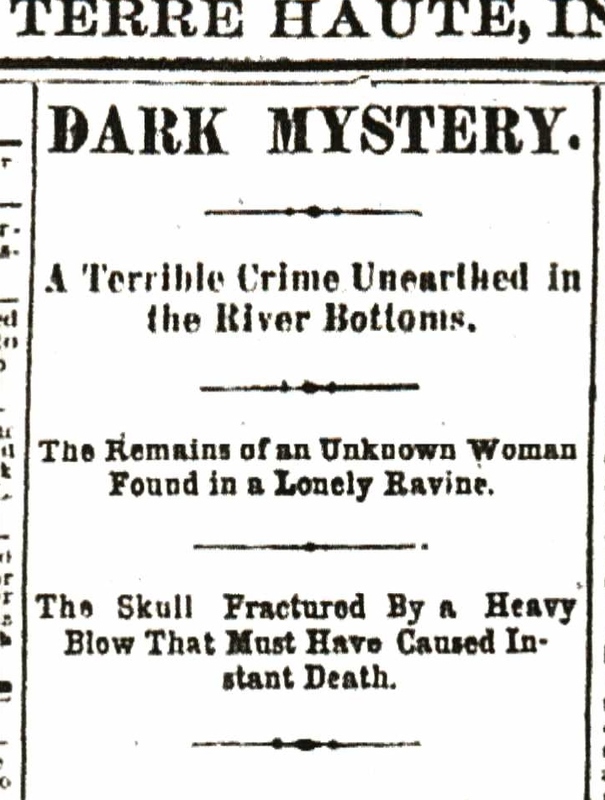 His examination led him to determine that the woman’s skull had been fractured by heavy blows. Hair discovered nearby caused the doctor to believe the victim was between 50 and 54 years of age. The searchers were polled and none could think of any woman that had gone missing from the area. Drought soon learned of yet another discovery. On Monday a man named Goetzinger who ran a gun shop in Terre Haute came to his office. Goetzinger told Drought that while hunting along the river bottoms near the murder scene on Sunday he had found a woman’s shoe. In it was a woman’s severed foot…..